There were many causes of the First World War. Some had been going on for a long time before 1914, historians call these long-term causes. Other causes happened shortly before war began, historians call these short-term causes. The main long-term causes of the First World War were economic rivalry, colonial rivalry and military rivalry. Each of the Great Powers was jealous of other Great Powers. To feel more secure the Great Powers formed Alliances to protect each other. By 1914 Europe was divided into two armed camps: the Triple Alliance (Germany, Austria-Hungary and Italy) and the Triple Entente (France, Britain and Russia). Economic rivalry was caused by each country trying to out produce the others in coal, iron, machinery and textiles. Each of the Great Powers was competing to sell their goods to smaller countries all around the world. The country that made and sold the most would become richer and more powerful than the other Great Powers. Colonial rivalry was caused by each Great Power building empires. The Great Powers competed in order to gain new colonies and to build bigger empires. Britain, France and Russia had huge empires in Africa and Asia; Germany and Italy were new countries, they wanted empires as well. Austria-Hungary had a large empire in Europe and wanted to expand into the Balkans. In 1908 Austria-Hungary added Bosnia, a small Balkan country, to its empire. Military rivalry was caused by each Great Power building up its forces to protect themselves and their empires. Britain had a large navy because it was an island and depended upon trade. Germany was a land power, but when it started to build a large navy this caused an Arms Race. Both Britain and Germany competed to build bigger and faster ships called Dreadnoughts. These long-term causes provoked tension and jealousy. The Great Powers were itching to have a fight. War was avoided between 1910-1914, but on 28th August 1914 a short-term cause acted as the spark or catalyst that began the war. 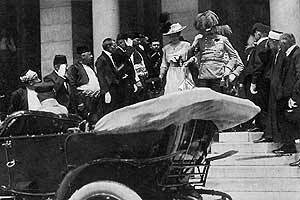 This was the assassination of Archduke Franz-Ferdinand, the heir to the throne of Austria-Hungary. He was killed whilst visiting Bosnia. The man who killed him was a Serb who lived in the Austria-Hungarian empire, but who wanted Bosnia to be part of Serbia. Austria-Hungary declared war on Serbia. Because most European countries had alliances they got pulled into the war. By 1918 over 50 countries around the world were involved in the First World War. There are many causes of the first world war. This activity looks at some of the major reasons for war breaking out. World Map showing Empires held by European states in 1914. Many European nations wanted to have Empires. Between 1870 and 1914 much of Africa was colonised by European countries. This led to several arguments between European nations. For example the Germans and French argued about Morocco in 1906 and 1911. In 1870-71 the German army attacked France. The Germans won this short war. As a ‘prize’ they took the regions of Alsace and Lorraine from France. The Germans claimed that they were rightfully German, the majority of people living here were French however. The French were very upset by this and wanted the land back. They were also fearful of the Germans attacking again. Map showing the location of Alsace Lorraine. The consequences of the Franco-German war (the war between France and Germany) were that France became suspicious and mistrustful of the Germans. They made sure that they had a large army and lots of defences to stop invasions. This in turn kept the Germans suspicious of the intentions of the French. The BALKANS (area between Austria and Turkey) was an area that the Austrians ruled much land in. However some of the countries in the area had very strong links with Russia and Turkey. Both of these countries were eager to increase their influence in the area. In 1878 this led to war between Turkey and Russia. From this point on the Balkans was an area that the Austrains, Turks and Russians argued over. Each wanted control of the area and they encouraged people in the area to support their claims for power. The German emperor Willhelm II had a dream of being an imperial ruler. He set his sights on having an Empire to match that of the British. To do this he would need to have a large and powerful navy. In 1900 Willhelm decided to put this dream into practice. He ordered the construction of several large and powerful boats. The British saw this as a threat and responded by building a ‘Dreadnought’. This was a fast and very dangerous boat. In turn the Germans started building this type of boat. A race started to have the largest navy. This race led to tension between Germany and the British. Franz Ferdinand was the crown prince of the Austrian empire. In 1914 he and his wife went on a visit to Serbia, a country that Austria had a strong influence over. Several Serbian nationalists, who wanted independence from Austria, decided that they would try to kill the prince. On 28th June 1914 they succeeded. His death led to the Austrian government making very strong demands on Serbia. Russia, keen to gain influence in Serbia, supported the Serbs. Days later the First World War had begun with the Germans declaring war on Russia. Franz Ferdinand and his wife shortly before they were assassinated. Why were the French suspicious of the Germans? Why were the Balkans likely to cause conflicts in Europe? Why did Britain and Germany have a Naval Race? Who was Franz Ferdinand and why was he shot? For each of the causes mentioned on these sheets say whether they are examples of Militarism, nationalism or imperialism. History (and even pre-history) is one, almost continuous, story of confrontation and invasion. The current state of the world shows this only too well. Since WWII alone, there have been well over a thousand wars: some have lasted days, others years. What contemporary conflicts are taking place? What made the First World War, the so-called ‘Great War’, in the minds of contemporaries, at least, was that it was the first truly global conflagration in history (given the extent of the participants’ empires). However, in other ways, it was arguably not unique, especially, in terms of its basic causes. A combination of circumstances at the time and Mankind’s innate, inherent failings, led to a conflict that would eventually see the deaths of over 9 million human beings. It was a war, in other words, that cost over 6000 lives (or two 9/11’s) a day - for four and a quarter years. Contemporaries, however, regarded the possibility of a long war unlikely. The German Crown Prince looked forward to a ‘bright and jolly war’. The British foreign secretary, Sir Edward Grey argued that the War would not last long and be over by Christmas, on the logic that a war between the Great Powers would be too ruinous to continue long. Wars are rarely, if ever, ideological. Wars are fought for far baser ideals than their participants are prepared to admit. In my opinion, the ‘just war’ concept has always been something of a myth. WWI was never a ‘just war’, despite each side proclaiming that it was. Cynicism is something that is unavoidable when studying the causes of wars, and is an especially useful state of mind to take when looking at the reasons for the First World War. But while WWI was, in many ways, not unique, it does have its peculiar causes. Even so, it is still very much an adequate and representative reflection of the follies of Mankind. A war, which had such appalling consequences as the one of 1914-1918 had, has to have blame accorded somewhere. Often called the ‘tragedy of miscalculation’ theory, it is a view propounded most energetically by L.C.F. Turner (1970). He argues that no one power really wanted war. He stresses the pacific feelings in 1914, of certain major powers and the misconceptions of the statesmen involved. His main contention is that: the eminent and wily statesmen of Europe had no real grasp of the technical issues connected with mobilisation, and so they failed to grasp its strategic and political implications. The War memoirs of David Lloyd George who commented that nations “slithered” into the conflict, concur, but are no more convincing. What significance, do you think, should be attached to the fact that Turner was a professor at the Royal Military College of Australia? After the war, and partly in a spirit of reconciliation, it was increasingly argued that no one power had been responsible for bringing about the war. In the 1920s and 30s, the so-called ‘Anglo-Saxon historians’ like Fay, Barnes and R.H. Lutz gradually began to relieve Germany of sole blame for causing the war. Such views can perhaps best be supported by looking at Britain’s role in helping to bring about the conflict. GB has been accused of being, while not overly aggressive, at least dangerously ambiguous in her aims and intentions towards Germany and the continent. Some historians (notably Geoffrey Barraclough and, most recently, the revisionist Niall Ferguson) have gone further and put a lot of the blame squarely on British shoulders. Germany, it is claimed, did not know what GB would do, once she put the infamous Schlieffen Plan into operation. Would GB support France? Would she support her other partner (but also imperial rival), Russia? However, these views have one main drawback, in my opinion: the infamous, if controversial, so-called ‘War Council’ of 8th December 1912. Held by the German Kaiser (Wilhelm II), with his main military advisors, to plan a future war in Europe that Germany could win, it referred also to the German realisation, provided by Lord Haldane that GB would actively intervene on the side of France, to maintain the balance of power in Europe, and thus prevent German hegemony. By utilising the Schlieffen Plan, Germany must have known it would be unleashing a major war (itself a reflection on the severe limitations of the Plan itself and the limited scope for tactical and strategic initiative it allowed). We should also note that Fay and Barnes themselves have limitations as historians, in that they may have been hoodwinked by the German authorities into accepting German blamelessness. Certainly, they had links with the ex-Kaiser (in the post-war years, exiled in the Netherlands) and other former members of the imperial government. How much, therefore, are their views objective history? Even at the time, contemporary historians like Renouvin of France and Schmitt of the US were vigorously disputing their findings. Ruth Henig also absolves France, Russia and even Serbia of much of the blame for the War, pinning the blame on Germany instead. What was the Schlieffen Plan? Show your understanding in diagrammatic form. Be prepared to explain it to the class. The other traditional, but frequently challenged view, is that Germany and her close ally Austro-Hungary bear the brunt of responsibility for the instigation of the war. Certainly, Article 231 of the 1919 Treaty of Versailles, laid the blame squarely on Germany and the Kaiser for starting the war. But then, history is always written by the victors and the treaty is, as such, hardly a reliable source of evidence! In the 1960s, however, the whole debate was re-awakened with the 1961 publication of Fritz Fischers’ ‘Griff Nacht der Weltmacht’ (Germany’s grasp for world power). This seminal work still holds sway. To Fischer and his disciples (Immanuel Geiss et al), Germany had caused the War and indeed did bear ultimate responsibility for it. This assertion caused an almost hysterical amount of controversy in German academic circles. Serious accusations, of a personal and academic nature, were levelled at Fischer by men like Professor Gerhard Ritter and later, H.W. Koch, jealous perhaps also of his fame and his access to the state archives, in Potsdam, East Germany, which as West Germans they could not get near! Germans, it seemed, could not contemplate the fact that their countrymen had indeed caused two world wars. A theory like Fischer’s, even seemed to endanger possibilities for future German re-unification. H.W. Koch has criticised Fischer’s research methods and selectivity, while admitting they are those frequently used in German academia! Koch takes a more benign view of Imperial Germany stressing its defensive postures and geographical exposure in the middle of Europe, quoting the famous maxim of G.P. Gooch, that: ”Geography is the mother of history”. What does: “Geography is the mother of history”, mean? Koch claims Germany wanted security above all else. Germany feared an Anglo-Russian seaborne invasion. He even speaks of the Schlieffen Plan as a “preventative, defensive stroke”. He points out the Germanophobia of high-ranking British officials, and that Germany was bound to support her one true ally, Austro-Hungary (1879). Koch goes so far as to say that, to the British, war in Europe was preferable to war elsewhere and that preservation of its empire mattered more to GB than anything else. A lot of what Koch says is controversial. What I aim to show is that the reasons for the War can be divided into ‘long-term causes’ and ‘short-term triggers’, and that contrary to what Koch says, Germany and the Kaiser, did indeed play the dominant, though admittedly not the sole role, in bringing about the world’s greatest and bloodiest war to date. A whole host of historians have re-iterated this argument including Dominic Lieven, Norman Stone, John Moses and Herwig. Luigi Albertini in his magisterial three volume history also famously pronounced Germany guilty. The causes of WWI, is a controversy ‘par excellence’. It is also a question without a definite answer. Even contemporaries did not fully understand what or who had caused the war. We may have the benefit of hindsight, but we can only accord, tentatively, degrees of blame, though the inimitable A.J.P. Taylor would dispute even that, as to him, blame is non-existent with great countries (“powers will be powers”). We can never answer a question on the causes of the Great War; we can only ever discuss the various possibilities. In examining the various possible causes and contributory factors we can, I believe, choose to stress certain ones and de-bunk others. In my opinion, imperialism, the internal problems of the great powers and their economic rivalries, were key factors. However, it is often easier to criticise a theory than to support one and that is what we will do first, by examining one of the factors that did NOT cause the War, but has sometimes been stressed as an important factor. We need to de-bunk the conspiracy theory that the War was caused by the armaments industry. Brian Bond in his book, ‘War and Society in Europe, 1870-1970’ outlines five convincing arguments to prove that the armaments producers did not bring about the War. It was not in the general interest of arms firms either to stimulate war or to become involved in customers’ internal problems: stable govts. offered the best prospects for orders; arms firms were unable to cope with demand once the War began and govts. tended to take over munitions production. Govts., if they had not bought weapons, would not necessarily have invested in the social infrastructure of their nations. There were no welfare states in 1914. If they hadn’t spent on arms they may not have spent at all. Ruth Henig also stresses that banks and businesses stood to lose rather than gain from war. However, though we must dismiss the role of the arms manufacturer, we cannot dismiss the role of the arms race, itself resulting from the evils of nationalism, xenophobia and militarism. Europe prior to WWI, was engaged in an arms race to greater and lesser degrees, depending on the country, and according to the principle (if we view these countries favourably) of ‘si pacem vis para bellum’ – if you desire peace, prepare for war. However, most of the great powers of Europe and elsewhere, had no intentions of being peaceful and instead had long traditions of using force to achieve their aims (so-called ‘gunboat diplomacy’). War was an instrument of power politics favoured by all. Gunboat diplomacy was thus rife, and imperialist wars fought, almost as a matter of fact. Political violence, even within countries, was far more prevalent than today. The military were frequently essential instruments of state control. Even in relatively democratic GB, the army was used to crush strikes and demos, sometimes bloodily. However, the degree of militarism varied starkly between countries. Chief amongst those who believed in military solutions to political problems or what was known as the ‘preventative war’ was Conrad von Hotzendorff. He wanted a premeditated strike at the heart of Pan-Slavism, Serbia. He, and others like him, were afraid that Slavic nationalism would cause the disintegration of the Austro-Hungarian empire. In an empathetic sense, we should perhaps realise such views were essentially defensive, but they can also be interpreted as imperialist and war-mongering. To Bernadotte Schmitt Austro-Hungary’s culpability in causing WWI is strong. He accuses her of a denial of self-determination to minority peoples within the Habsburg empire and claims this was the crucial cause of WWI. Certainly, to contemporaries, Germany, and specifically Prussia, was the arch-militarist state, a view that even on closer inspection still rings true. K.D. Bracher describes the German state as essentially Prussian, militaristic and authoritarian, though it was perhaps not as unique in this, as Immanuel Geiss would argue it was. Certainly, the officer corps was drawn from the reactionary, junker class; the middle class citizen’s dream was to become an officer in the reserve. There was an almost ubiquitous respect for the military (shown by the ‘Captain of Koenig’ incident), absent in many other countries. By 1914, Germany had a standing army of 800 000 men, with a further 5m trained reservists. The govt. spent 90% of its income on ‘defence’ (Russia, in 1913, spent 58% of its income on the armed services, suggesting it was not only the German government that regarded military expenditure favourably). The building of the High Seas Fleet nearly bankrupted the German state. General von Bernhardi, and other military advisors, stressed the importance of expansion to secure Germany’s future. Thereby, as with Austria, aggression was justified as both defensive and preventative in purpose. Prior to 1914 hundreds of miles of track were laid going in the direction of the Belgian border – clearly in line with the strategy of the Schlieffen Plan. To the unstable and ambitious Kaiser, himself a devotee of all things military, the High Seas Fleet was the means to such an end. He wanted his empire to become as great as GB’s – by emulating British methods. The building of the German fleet was thus the pinnacle and, in a way, the logical outcome, of the European arms race mania; however, it was a situation that helped to make the continent fatally unstable. A.J. Marder (1961), stressed the significance of the naval rivalry, claiming that while it did not cause the War, it determined that GB would be on the side of Germany’s enemies. “The Anglo-German naval race did not cause the First World War, but it played a significant part in preparing an explosive situation, which was detonated elsewhere”. France was certainly a less militaristic country than Germany. She was more constitutional and less autocratic. However, as the Dreyfus affair had shown, the French army was largely reactionary and anti-Semitic in nature. French troops were engaged in imperialist ventures around the globe (and, as in Indo-China, frequently committed atrocities), while as in Germany also, there was a system of national military service (which was considerably lengthened in 1913). The army tended to be anti-democratic and papers like ‘La France Militaire’ called for a “beautiful” war against the barbaric Hun. However, in the provinces at least there was a great degree of passive feeling. Henig emphasises that the thoughts of revanche for the loss Alsace-Lorraine, were no longer dominant, national feelings. The conscription bill of 1913, which increased the length of military service to 3 years, was opposed and unpopular, but a response to increases in German military spending. Here the situation with regard to the armed forces, was decidedly more ambivalent, especially vis a vis the army (the navy was more popular). The British army, in contrast to nearly all those of the other great powers, was elatively small and entirely voluntary. British ‘Tommies’ were sometimes lauded as heroes, most times ignored or even despised. However, an officer corps of sorts did exist: drawn from the public schools and the upper and upper middle classes; men who were often regarded as fit for nothing else, but soldiering. Being an officer was, at best, mildly respectable. Militarism, however, was despised, though wars like the Boer War of 1899-1902, brought thousands flocking to the colours. Equally, it should be remembered that 1914 also saw hundreds of thousands volunteer, though the supply was soon to dry up. All Europeans to a greater or lesser degree were nationalists. Many were also xenophobes. Any sense of Pan-Europeanism was absent. The books and novels of the time were frequently concerned with the likelihood of war and invasion. In Germany, there was ‘Der Weltkreig’ (1904), which depicted a fictional German conquest of GB. In GB itself, William Le Queuz’s ‘Invasion of 1910’, sold numerous copies, as did Erskine Childers’ ‘Riddle of the Sands’ (also published in 1903). Both novels represented Germany as aggressive and expansionist. Such right-wing, scare-mongering literature, not only actively prepared their respective populations for war, but made it, arguably, more likely by spreading rumour and suspicion. Schools helped imbibe nationalist pride. Sir Michael Howard, the eminent military historian has even stated that if: “the youth of rival countries howled for war in 1914, it was because for a generation or more they had been taught to howl”. J.M. Roberts says nationalism provided “psychological and emotional support” to governments. There were National and Navy Leagues in Germany and GB. Britain may not have had conscription, but the National Service League (estd. 1902) wanted its introduction. In France, Russia and Austria, there were similar pro-military organisations. In Austria-Hungary and its empire, there were even proto-fascist parties like the Workers Party of Austria (led by the infamous Karl Lueger, a man the young Hitler admired) and the Czech National Socialist Party. In the Habsburg Empire in fact, there was no unified opposition party to oppose the will of the autocratic and reactionary Emperor, Franz Josef. Instead parties were organised along national boundaries. Such organisations and leagues that existed in pre-War Europe had often a no. of elements in common with each other: they were rabidly right-wing; had leanings towards totalitarianism; made lurid appeals to the badly educated working classes and wanted to militarise youth. Europe was, therefore, hardly very liberal prior to 1914. There existed a climate of distrust and fear arising both from ignorance and prejudice. The British distrusted the Germans and vice versa; the French had an inbuilt chauvinism against all foreigners, but especially the “barbaric Hun”, etc. When it came to war in 1914, even so–called internationalists and socialists eagerly donned a rifle and pack and acquiesced in the slaughter of men whose only real difference was that they happened to be born elsewhere. This is how the major powers came into actual conflict. Once again we see a definite bias in the evidence towards German aggression and ambition as the most prevalent factor in the equation. Germany in fact had many expansionist-minded individuals both in the military and in its civil govt. As we have seen, two of the most prominent were the Kaiser himself and General von Bernhardi. Others included the von Moltkes and Admiral von Tirpitz, who wanted to achieve world-power status and Germany’s rightful “place in the sun”, through the creation of a High Seas Fleet. Many high-ranking Germans wanted their country to have colonies, given the prestige and status attached to the possession of an empire. As a relatively new nation though, only unified by Bismarck in 1871, Germany had arrived late to the carve-up of the global pie. The stark reality of Germany’s possessions was galling. ‘Imperial Germany’ had a few scattered possessions in Africa and a collection of meagre islands in the Pacific. Her subjects totalled 12m; GB had 400m in its ‘care’. Germany, in its mind at least, had a right to look enviously upon its neighbours’ possessions. Germany’s colonialism was also a useful political tool, a way of combating the public’s anglophilia by inducing jealousy and mistrust of GB. Was not the selfish and greedy England denying the Fatherland its rightful ‘place in the sun’? As well as the military, the German public and its civil govt. were eager for overseas possessions. In 1893, the Pan-German League came into being to promote expansion and imperialism. It was followed, five years later, by the German Navy League. Certainly, the German chancellor, Bethmann-Hollweg, a personal appointee of the Kaiser’s, had great territorial ambitions after (and presumably before) the War had broken out. Ideas of lebensraum and expansion to the East were not unique to Hitler or even novel in 1914. Bethmann-Hollweg’s writings express considerable bellicosity: France was to be totally humiliated and finished as a rival; Belgium was to become a vassal state; Luxembourg would be annexed and neutral Holland “brought into a closer relationship” with the Reich. Germany’s ambitions in Eastern Europe (Ukraine) and Africa were clearly outlined. To Henig, Germany would exploit the Balkans crises for instance, to change the status quo in its favour. However, there are those, like H.W. Koch, who believe German expansion was due to fear of encirclement and isolation. But Germany’s defensive acts could always be construed as aggressive by her neighbours, of course. Certainly, Germany was to support Austria in July 1914 knowing this might well trigger a major war. It would, therefore, be stretching credulity to regard Germany as an innocent amongst wolves. To Koch, Ferguson et al though, GB was a far from blameless country and indeed this seems one of Koch’s more reasonable and plausible arguments. GB had a massive empire and was determined to hold onto it by all means. GB was far less concerned with Europe, as A.J.P. Taylor points out, and was in fact isolationist with regard to the continent. The German High Seas Fleet, was so feared simply because it threatened Britain and her empire directly. Up until its construction, Germany had been seen as a natural ally against Britain’s greater imperial rivals: France and Russia. In 1898, at Fashoda in the disputed Sudan, GB and France had almost come into direct military conflict. In Russia’s war with Japan of 1904-5, GB had overtly supported the latter emerging power. It was not until as late as 1904 and 1907 that agreements with France (the ‘entente cordiale’) and Russia respectively (the so-called Triple Ententes) had come into being. Even then, these agreements were opportunistic, being motivated by a mutual fear of an increasingly ambitious Germany. GB’s main aim therefore, can be fairly seen as the maintenance of the status quo that so suited her – and the exclusion of the upstart, parvenu Germans. Koch has even gone as far to state that to GB: “War in Europe was preferable to imperial insecurity, which might well lead to the collapse of the Empire altogether”. The invasion of neutral Belgium in 1914 was thus the ideal excuse for British intervention. “Poor little Belgium”, which had committed such hideous imperialist atrocities in the Congo, and which Ferguson maintains, given its strategic value, the British would have invaded themselves, if the Germans had not! It is therefore very difficult and undesirable to place the total blame of imperialist ambition entirely on German shoulders, especially as France, Austria, Russia, Serbia, Turkey, Japan and even the USA, had definite territorial and imperialist desires and ambitions themselves. The major powers were economic, as well as imperial rivals. Contemporary historians of the War (like Niall Ferguson), increasingly stress the role of trade and commercial rivalries. Wars are often the result of economic factors, of clashes over valuable ‘spheres of influence’. It is possible for instance to say that the direct and indirect economic causes of WWII were paramount, especially in the Far East. To Lenin and other Marxists WWI was triggered by greed, a view echoed by Woodrow Wilson (who also blamed the evils of secret diplomacy). Economic and territorial/imperial rivalries were made worse by the internal problems of the major powers. Since ancient times, internal difficulties have frequently been solved by foreign wars or foreign expansion. Modern analogies abound with foreign successes trumpeted to drown the silence of domestic failure. The internal problems of the pre-War states, is increasingly viewed as a crucial factor in their decision to go to war. Can you think of more contemporary examples of war playing a diverting role? Germany, the economic and military giant, had socio-economic feet of clay. Germany’s economic growth was not matched by a political and social maturity. It had innate and inherent political weaknesses. K.D. Bracher calls it a “pseudo-constitutional, semi-absolute, feudal, military and bureaucratic state”. Thomas Mann (author of ‘Death in Venice’) parodied the ‘ideal’ German as “General Dr. von Staat”. Hans-Ulrich Wehler also stresses internal problems within a faltering German state, as a driving force. The Kaiser detested democrats, liberals and especially socialists and even contemplated having all the latter shot on the outbreak of war. The fall of the architect of the German state, Otto von Bismarck, in 1890, had only made matters worse and the govt. even less stable. In Brachers’ words, there “emerged a growing tendency to neutralise the problem by diverting the domestic pressures of social emancipation towards an imperialist expansion”. Society would become more conservative, it was argued, through war. The Crown Prince, as early as 1911 was agreed that: “the confused and hopeless domestic situation would improve at a stroke, if all the people of our country were called upon to take up arms”. It was an argument many others understood only too well. In GB, internal problems were also manifold and are increasingly studied, though controversial: the Left and Right squabbling over their historiographical importance. GB in 1914, certainly had many looming or actual crises to deal with and a war would be a useful diversion. In Ireland, civil war was very near to breaking out over the prospect of ‘Home Rule’. The Protestant Ulstermen had accumulated a large stockpile of arms and ammo. and were prepared to fight. The Curragh Mutiny had shown that the British army was sympathetic to the Protestants and even the Tory party, under Bonar-Law, were prepared to condone violent opposition to the Home Rule Bill. In the rest of Britain, the unions were becoming increasingly powerful and the big three of miners, dockers and railwaymen, planned a major strike for September 1914. Britain was beginning to decline economically and was a far from contented country. 0.4% of the population owned a massive 65% of its wealth. In contrast, only 1/3 of recruits in 1916 were fully fit for service, due to the ravages caused by industrial, slum conditions. Bantam battalions even had to be formed during the war to make use of the massive no. of men who were below the required height (c.1.60m). The unwritten, British constitution was under considerable strain: Britain was not a full democracy (some had two votes, others none) and suffragette militancy was at its height. The War conveniently postponed these crises, something, which was perhaps not entirely coincidental. George Dangerfield in his book: ‘The Strange Death of Liberal England’, believed firmly, that political collapse was imminent in 1914. It is a view supported, though for different reasons by the right-wing historian, Paul Johnson, who boldly claims that: “our parliamentary democracy itself was perhaps saved in the mud of Flanders”. We have examined the long-term, ultimate causes of WWI. Now we need to look at the short-term crises and ‘trigger’ factors, which culminated in the Sarajevo incident (itself, I would argue, a result of the instability in pre-War Europe, rather than its cause). What had made Europe by 1914 as unstable, volatile place? The long-term factors included militarism, nationalism, etc. These were reflected in the events of the few years prior to 1914, which helped to bring the European powers into direct conflict. The Kingdom of Morocco, in North Africa, was an archaic, weak state. It was also replete with mineral deposits like iron. It was, therefore, ripe pickings for the scavenging great powers in its vicinity. The French were the most ambitious with regard to this particular part of Africa, and wanted to take effective control over the kingdom. GB and Italy agreed to a French mandate; the former due to France’s willingness to reciprocate by relinquishing claims in Egypt. Spain was also given territorial concessions for not opposing French designs. (Known also as the ‘Agadir Crisis’, after the Moroccan port where it took place). This crisis has been seen as an illustration of the evils of secret diplomacy, according to E.D. Morel and Ramsey-MacDonald. W.N. Medlicott disputes this view, saying instead that secret diplomacy solved a crisis begun by open, diplomatic posturing. France wanted greater control over Morocco, Germany wanted compensation in terms of commercial and industrial access, and was prepared to try and achieve it using gunboat diplomacy. In the end, she backed down from the prospect of war with France and GB. The crisis strengthened the entente and confirmed British views of Germany as lusting for European hegemony; Germany’s distrust of GB was also deepened. Medlicott sums up the significance of the crisis succinctly: “The Agadir affair was a symptom, a warning light, but it did not create the basic animosities”. A similar conclusion could be drawn on the other crises. The machinations between the great powers are best seen in the area of the Balkans. The annexation crisis is an excellent example of the territorial and imperial ambitions of the powers and the ulterior nature of their professed motives. Results? Austria wins a seeming, but ultimately misleading, victory; the South Slav question remains unanswered; Russia has been humiliated and will seek revenge, as will Serbia. Europe is dividing into the sides that fought WWI. The Balkans was the most unstable area in Europe. An arena of Pan-Slavic ambitions and continental rivalries, where, in the words of J.M. Roberts, “two great states (Austria and Russia) sought power and influence in an area abandoned to feeble and bickering small states, by the Turkish retreat”. Henig puts it perfectly: the Balkans Wars by defeating and driving out the centuries old Ottoman Turkish Empire removed the shock-absorber or buffer. Now Russia and Austro-Hungary could directly rub up against each other – with fatal results. The presence of Serbia, which itself had territorial ambitions and in particular a desire for seaport and which Austria, by any means, wished to deny her, only complicated and inflamed matters. The various countries in the area had complicated relationships with each other. The Turks had once controlled the Balkans, but were now opposed by Serbs, Bulgars and Greeks. The Greeks and Bulgarians distrusted each other, partly on religious grounds and partly because of their conflicting, territorial ambitions. Serbia cast envious eyes upon the tiny kingdom of Montenegro’s 28 mile coastline. Serbs and Bulgars detested each other, a feud dating back to the Middle Ages; while Serbia, Bulgaria and Greece all coveted Macedonia, the rich province still in the Turkish empire. 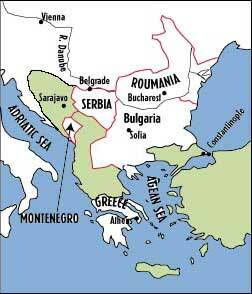 In 1912, Serbia and Bulgaria helped by the Russians (who wanted to be seen assisting their fellow Slavs and who saw the prospect of gaining an ice-free port) formed an alliance agreeing to divide up Macedonia between them. Other alliances led to a fragile, Balkan league in the same year. The common enemy, the Turkish or Ottoman Empire was weak with a no. of internal problems: the ambitious Italy was attacking her possessions in Tripoli; the Albanians and Arabs of the Yemen were in revolt. Politically, and religiously, Turkey itself was also in turmoil. In 1912, the Balkans allies declared war on their common enemy: the Turkish empire. The Turks were defeated in separate campaigns by the Serbs and Bulgars. The Greek navy too did well and the main Greek army reached the vital port of Salonika, before their Bulgar rivals. The First Balkans War, ended officially in May 1913. The land, which Turkey had lost, was to be squabbled over by the victorious powers, except for Albania, which became an independent country in its own right, in 1913. The Greeks and the Serbs then fell out with their traditional enemy and rival Bulgaria. This led to the Second Balkan War, with the Romanians and Turks joining in the attacks on Bulgaria. The resulting treaty and defeat of Bulgaria, saw territorial and economic gains for the victorious–their real reasons for going to war. Bulgaria, under its German-born Tsar, Ferdinand, began to seek revenge and looked to and found an ally in Austria-Hungary, Serbia’s old enemy. Meanwhile, Greek and Serbian territorial ambitions remained unabated. Turkey feeling weak and vulnerable needed a strong ally. She found one in a Germany only too willing to gain influence in a disintegrating empire in eastern Europe and Asia. Partly because of the conflicts in the Balkans, but also because of the instability Germany was provoking, many politicians and diplomats from 1912, claims Henig, believed a major war now to be inevitable. On 28th June, 1914, Gavrilo Princip, a fanatical Bosnia-Serb, assassinated the heir to the Austro-Hungarian throne, Archduke Franz-Ferdinand, in the cosmopolitan city of Sarajevo. Franz Ferdinand was on a day of many ironies, no war monger. A spikey and sinister individual, he was also a relative moderate (prepared to contemplate granting political participation to his future Slav subjects) and a devoted and loving family man. Princip, a young 17 year old zealot, was involved with the Serbia nationalist group, the Black Hand gang. He was fortunate in a number of ways that his plan succeeded. The Archduke had survived an attack earlier that day by one of Princip’s confederates, but had still refused to cancel his schedule. The Archduke’s driver took a wrong-turn drawing up to Princip who was on the verge of going home. Lastly, Franz Ferdinand was wearing a revolutionary new bullet proof vest. Unfortunately for him (and the rest of the world) Princip shot him in the throat. Poor old Sophie also died. Princip had fired only two shots. He was too young to hang, but died in prison of TB aged 19. Austria knew who had ordered the killing and why the assassination had taken place. She duly provoked war with Serbia (Williamson emphasises Austria’s determination to exact revenge on Serbia), after being given total support by the Kaiser (the so-called ‘blank cheque’), as an excuse to curtail Serbia expansion and attacks on the old Habsburg empire. Henig emphasises that it was this ‘blank cheque’ (5-6th July) that really precipitated conflict. Russia, Serbia’s ally and protector, the ostensible champion of the Slavic cause (though only too willing to sell it out when propitious to do so, as we saw in 1908) rallied this time to the Serb’s side, mobilising her massive army in their support. Germany supported, Austria, arguably, fully knowing the consequences of doing so. Why was Austro-Hungary so eager to provoke war with Serbia? Basically, because the Serbs with their own territorial ambitions and concerns to champion the rights of other Slavs within the Austro-Hungarian empire, were a destabilising threat to the status quo. Austria-Hungary wanted also to deny Serbia access to a port and the economic possibilities for growth this would present. Russia supported Serbia as a means of gaining an ice-free port on the Adriatic; it also looked good in a country beset by so many internal problems, to be seen to be supporting fellow Slavs. Again, therefore we see the selfish motives of the major (and upstart) powers taking control and enflaming an already dangerous situation which, combined with other long-term factors, produced the first ever truly global conflict in human history. The Germans had basically only one strategy, once war had been declared. The Schlieffen Plan, designed as a way of achieving a quick victory against the French, it would then enable the Germans to turn east and face the more slowly mobilising, but huge Russian army. The Plan however, like many plans, had one basic flaw: besides being inflexible, it would involve the invasion of neutral Belgium, a country protected by Britain since 1839 (albeit for its own commercial and strategic reasons). Therefore, once Germany had attacked a country vital to Britain’s interests, never mind France, Germany would find itself at war with the British as well and so embroiled in a full scale European conflict –something the megalomaniac Kaiser must have known. The British used ‘little Belgium’ (in reality, the vicious, sadistic Congo colonial power) as the excuse they needed to try and curtail the threat to the balance of power, their commercial interests – and their precious empire, the upstart Germans posed. The consequences of WWI ranged from the trivial to the enormous, ultimately leading to the Russian Revolution, WWII and even the Cold War. The First World War saw enormous strides made in terms of medical techniques that were to be some of the few humanitarian benefits of the war. Trains were used for the first time to evacuate casualties; surgical techniques, especially to the face and head, improved enormously, as did reconstructive surgery. Psychiatry became respectable branch of medicine, after it dealt with so many shell-shock cases. Blood and plasma transfusions saved many lives, and disease was no longer the chief killer of soldiers, as it had been in the American Civil War (1861-65) and the Boer War (1899-1901). The War saw a no. of developments. Tanks were used for the first time in 1916; submarines proved their strategic worth in attempts to starve out an enemy; poison gas was released by both sides, and aeroplanes and airships were used in the first aerial bombardments of civilian targets. The bayonet and sword only accounted for a tiny no. of casualties. The nature of warfare had changed forever. The benefits and horrors of industrial-era warfare were soon felt, as the casualty lists were sickeningly long and seemed to be never-ending. The quality British press, which initially printed the names of all the dead, later could only find room for officers. Though the War saw many changes in terms of who controlled countries or provinces, there was little fundamental change in the principles of imperialism, which were still firmly upheld. In that sense, little was learnt from the war. Instead a form of musical chairs took place with Germany being deprived not only of its own overseas colonies, but a large slice of its home territory (13.5%). Hiden has said that more than anything else, these territorial losses angered the German people and helped to lead to the rise of Hitler and ultimately WWII. The war did not mean Europe was a more tolerant place. Instead, the devastation of economies (Germany, Austria, etc); post-War slumps (Spain, etc) and unrealised territorial ambitions (Italy’s claims on Fiume and Dalmatia, etc) led to the growth of both extreme right and left-wing groups. In Germany, starvation and the de-mobilisation of millions of veterans led to starvation, attempted putsches and revolution, including wide scale political assassination and near-anarchy. Communists, radical socialists and ultra-nationalists fought for control in the streets. In Italy, the post-War slump and the disappointments of Paris, led to the rise of Mussolini and fascism, which was in power by 1922. The War itself, of course, had directly led to the foundation of the world’s first communist state, Bolshevik Russia, in 1917. This was to have enormous implications, which have persisted to the present day. Even in relatively stable countries like GB, disillusionment with the War had encouraged (along with the Great Depression) veterans to join the communist or Oswald Moseley’s British Union of Fascists (BUF). How does the Russian revolution still affect the modern world? The War had been good for countries like neutral Spain, which had provided food, uniforms and guns to both sides. However, the moment the war ended demand ceased and Spain experienced a slump. This was to have important socio-political consequences for an essentially poor country, and ultimately helped to lead to the Spanish civil war of 1936-39. Even countries like France and GB that had won the War lost out economically, and were virtually ruined by the costs of the fighting (£5.5 million per diem for GB alone). Britain’s gold reserves were effectively wiped out and she was never again to be the great power she had been pre-1914. France had been so damaged by the German occupation of her industrial regions that she desperately needed the compensation demanded at Versailles. So much so, that France again risked war in 1923 by occupying the Ruhr. The War did have some promising outcomes. The creation of the League of Nations being the paramount one, and though it was fundamentally flawed from the beginning, it did at least have noble intentions. ‘Collective security’, disarmament and the desire not to resort to force, were all commendable ideas, and laid the foundations for the later and much more effective UNO. Unfortunately, lack of an army to enforce its ideals; the absence of Germany and Russia and especially the USA, almost doomed it from the start. The British PM, David Lloyd George, had famously declared GB would be “a land fit for heroes” to return to. However, his idealistic intentions were never matched by deeds and GB continued to be a country of rigid class divisions and slum dwellings. However, GB was not alone in its continued conservatism and the people of Europe soon realised that the War had not been fought for any high ideals at all. They had been lied to. WWI also saw enormous impact decades afterwards. One of the most poignant results of the War, in lots of ways, was appeasement. Many politicians on the allied side were determined that never again would Europe be embroiled in a bloodbath on the scale of 1914-1918. However, to this extent men like Chamberlain of GB and Daladier of France, were prepared to acquiesce to Hitler’s demands in the 1930s. In this way, their actions helped to lead to another war in 1939. The United Sates really came to prominence during WWI. American economic strength, as much as military prowess, helped the allies to win and Germany to realise she could never triumph. After the War, US president, Woodrow Wilson, was prominent at Versailles negotiations and urged on France and GB restraint when it came to Germany. He was also the primary instigator of the League of Nations, and urged his nation to join, but was defeated by the isolationist views of his countrymen. Isolationism was a short-sighted policy that was also to help bring the world to future conflict in 1939. The end of the War also saw a number of dynasties that had helped to cause the War in the first place by their autocratic and imperialist minded policies. The Hohenzollerns of Germany were finished. The Kaiser was allowed to skulk away to the Netherlands where he died in 1941. The centuries-old Habsburg dynasty in Austria also came to the end with the forced abdication of the last emperor, Franz Josef having died in 1916. Ironically the last Habsburg, Otto, is ironically perhaps a staunch democrat in the European parliament – and is still threatened by the Serbs! The 300 year rule of the autocratic Romanovs came to a particularly abrupt, and in their case, bloody end. And though there is perhaps some justice in this, his death also helped to lead to evils of Soviet-style communism and ultimately the Cold War. 12. REALLY A VAST GLOBAL ENTERPRISE: EUROPE BECAME AN ENORMOUS CAULDRON INTO WHICH MEN & RESOURCES FROM ASIA, AFRICA & AMERICA WERE POURED. 13. 1 NOTED HISTORIAN OF PERIOD CALLS YEARS PRECEDING WAR AS "ROAD TO ARMAGEDDON"
6. DID GERMANY HAVE PLAN OF BECOMING WORLD POWER? e. EVEN A SCHEME TO WIN OVER THE U.S.
8. BOTH STARTED IN TUDOR TIMES 16TH C.